IELTS Tips and Strategies: What it means when you say "literally"
One criteria we have to keep in mind when it comes to the IELTS is Lexical Resource. The IELTS candidate should not only be familiar with new words and their meanings, but should also be knowledgeable with regard to their proper use. Here's an informative - and hilarious - comic from The Oatmeal where he discusses something about the word "literally". Now that you know what "literally" means, continue reading the rest of The Oatmeal's funny comic so you'd learn how to use it. 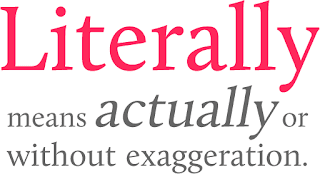 Go to The Oatmeal - What it means when you say "literally".